What is a Bench Hook? 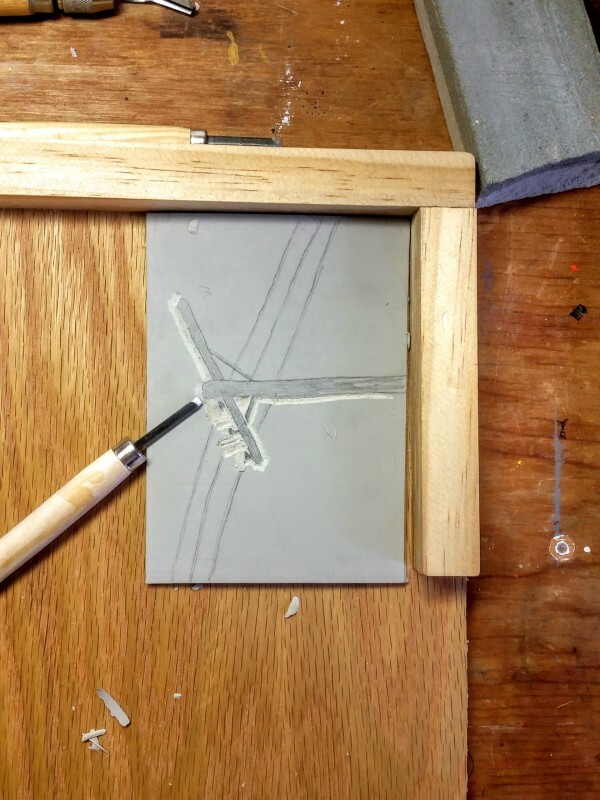 Every day, relief printmakers place their hands in the line on danger. I know firsthand, and I have the scars to prove it. You probably do too. What if I told you there is an inexpensive way to protect your and your students’ precious phalanges? 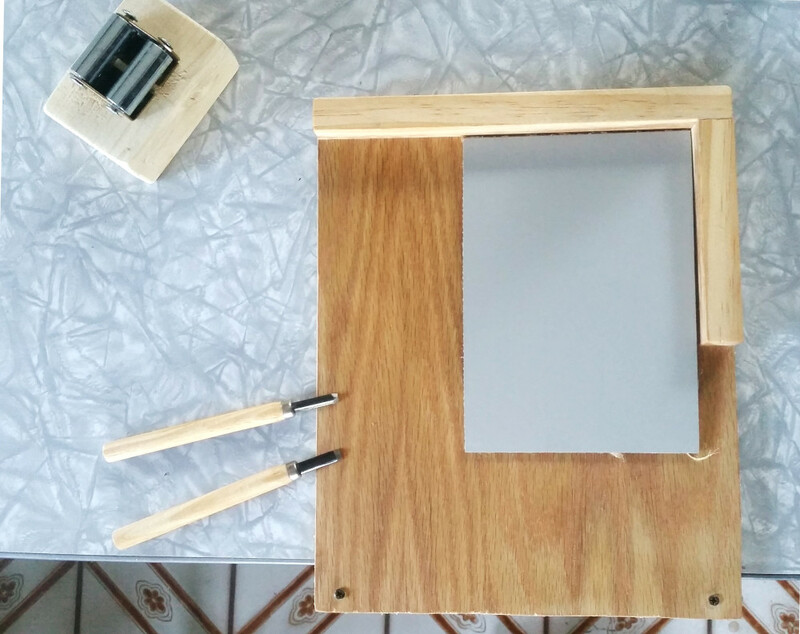 A printmaking bench hook is a board that holds your carving plate for you, keeping your fingers out of harm’s way. It catches on the edge of your desk (i.e. kitchen table) and cradles your plate in its corner, so you don’t have to hold it. You know that moment when you zone into carving, and you forget about where you’re holding your plate and then your blade slips? In this case, it nicks the wood lip along the bench hook, and not your hand. No band-aids. No stitches. You can keep on carving. 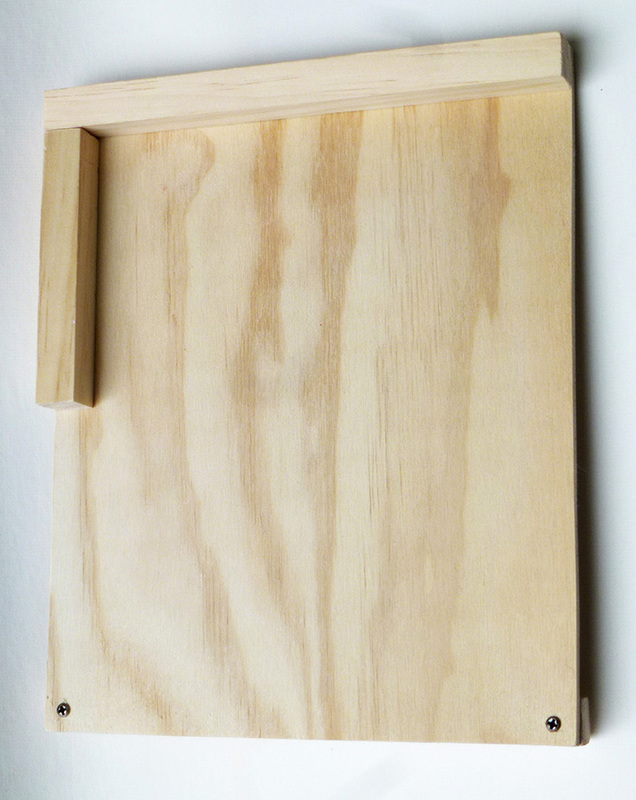 What Kind of Bench Hook is Best for a Printmaker? 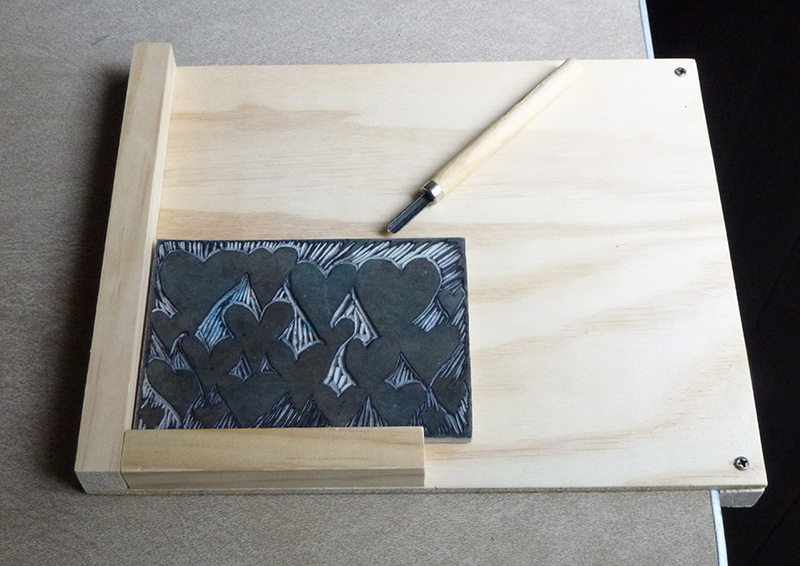 First, let’s talk about what a printmaker wants in a bench hook. We carve at an angle, so it’s imperative that our bench hook have a corner nook. Make sure the corner is on the correct side of the board for you. The carving corner is on the left side for a right hander’s bench hooks, and on the right side for a left hander’s bench hook. I recommend a bench hook made out of wood, rather than particle board, if possible. Over time, particle board gets stripped, causing the wood stops to wiggle and break off. This is why you need a wood bench hook. Unfortunately, these are hard to find, and I’m not always able to keep them in stock. How Can I Get a Bench Hook? You have two choices- you can build it or you can buy it. I recommend building your bench hook. It is such a simple woodworking project, and not to mention, and investment in your health. There are not many printmaking bench hook purchase options for purchase and I’m not always able to keep bench hooks in stock, so I now keep my Bench Hook Building Plans in the shop here. The video and illustrated step by step instructions are easy to follow and the materials can be found at most hardware stores. 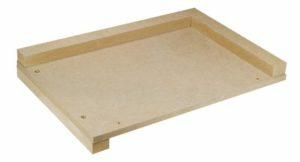 Where Can I Buy a Bench Hook? Here in the shop sometimes. When I build a batch of bench hooks, you can be sure I’ll share it on Instagram, twitter, or in my newsletter. In the meantime, there are a few more options. 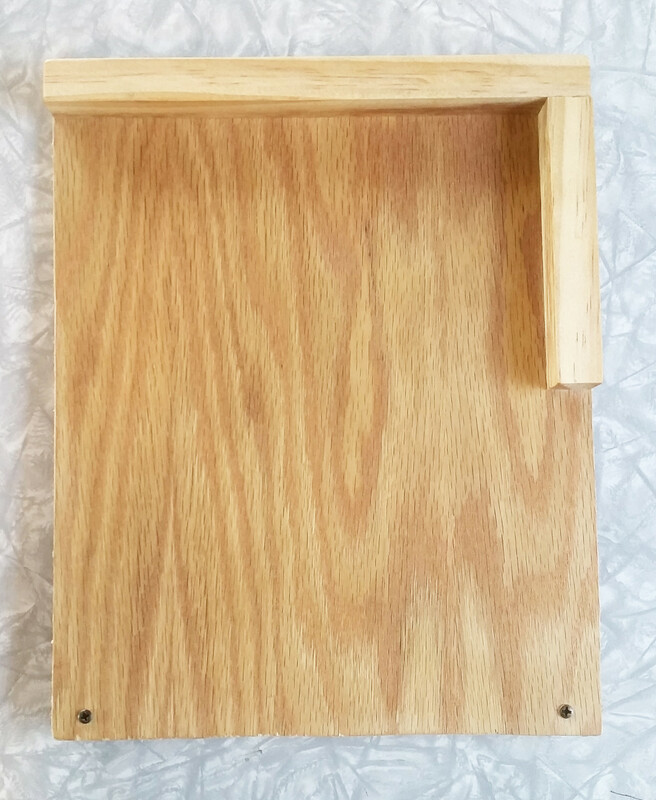 This Bench Hook, made by the Educational Arts company, is available in different places across the internet, from eBay to sites with names like BigaMart and Fishpond. A quick look shows that Americans get the best shipping rate from eBay sources, while UK residents should stick to the other aforementioned shops. The bench hook is usually priced reasonably, but be wary of astronomical shipping costs. It appears to be made from particle board, rather than wood, so consider it disposable. Some sites show that the side carving lip can be lifted out and switched to the other side to make the bench hook left handed. Speedball offers a metal bench hook, but you will still need to secure the plate with your non dominant hand when carving because it has no side bar. My objective is to keep those fingers out of the picture entirely, though, so it is not my top choice. 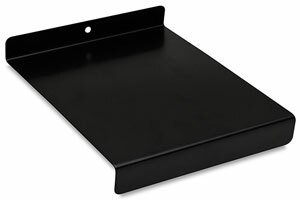 It does doubles as an inking plate, but without the side bar, it cannot be used for quick registration, either. My favorite alternate use for a bench hook is as an quick registration system for spoon and baren pressed prints. This only works for printmaking bench hooks that have a side bar. Use the cozy corner to perfectly line up your paper and your plate. 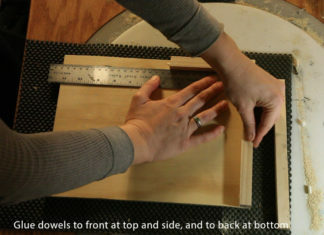 This works great for cards and other projects where the paper is the same size as the plate. I also use my bench hook when building presses because it keeps the wood block from spinning around when my drill has too much torque! If you’ve been printmaking without one, watch where you place your hand when you first start using your new bench hook. Out of habit, you may still place your hand in the path of the blade, even though the bench hook holds the plate steady for you now. Keep that non dominant hand safely wrapped around the handle of your mug.